Her biggest break should be as Kim in Ms. Saigon, I flew to Manila from Cebu and watched her at CCP and I was so hoping that it should be her and not her alternate and YES, it's her! As the singing voice of Princess Jasmine in Disney's Alladin and Fa Mulan in Disney's Mulan, I never thought she'd sound good for cartoons! Over the weekend, I purposely flew to Manila from Cebu once again to watch her as Cinderella. I booked tickets and tagged along my aunt, 3 cousins and 5 nieces! I was so excited. I am impressed with the production, performance, the lyrics & script and the whole cast. The carriage was oh so pretty; the rats were hilarious; i just love her gown for the ball and how it turned to rags ooh, they just made impossible things happen... everything is simply magical. Have a sneak peek! Watching the show, brings me back to my happy childhood. I enjoyed watching these disney princesses finding their prince charming and lived happily ever after. I never realized their's was a case of whirlwind romance (ten minutes! ), of course I didn't know anything about that back then. haha The story brings hope to anyone. 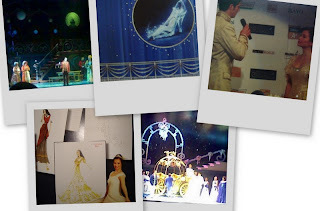 Rodger's & Hammerstein's Cinderella runs from July 29 to August 24, 2008 at CCP main theater. Tickets are available from P500 to P7,000 at www.ticketworld.com.ph or selected block sales agents. Their Asian tour will follow soon. *Show starts promptly as published (3pm or 8pm), late comers will be allowed entry minutes later. *Be warned, there's a long line to the comfort room. *Bring some cash, souvenir program (P200), a Tour Cast Recording CD (P550), caps (P400), shirts (P700), glass slippers key chains, charms, rat stuff toy (you'll appreciate it after watching the show) and more are available for sale. Watch and blog about Cinderella and win glass slippers!